A little bit about you? 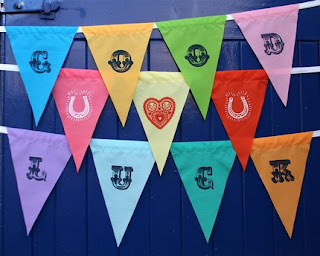 We are both designer-makers with a passion for bunting. Xtina Lamb is an artist and illustrator producing lovely prints and books with her Japanese Print Gocco Machine. Gillian Elam is part of Fabric Nation, recycling vintage fabrics into nostalgic and vibrant homewares and accessories including a collection of cats, dogs and other strays from the 1950s and 60s. The buntees (bunting makers) will be have a choice of kits (£2 to £4 to cover the fabric costs) to make bunting to deocrate their tents, cars or themselves. The bunting will be ready-made and materials provided to customise and decorate it. There will be a prize for the best. We will also be holding a competition to design an 'Indietracks' camping pennant in the style of old camping and caravan club pennants. We will have a little collection of these on display as well as Xtina's fabulous gocco printed bunting. The winner will have their design printed up and everyone taking part will receive one! Its hard to choose, such a wonderful combination of woodlands, steam trains and fab music and meeting lots of new people with a waeakness for bunting! Decorate your tent! Bunting, flowers, flags, glo-sticks. We are first-timers, but know all about you! Thanks! You can catch the workshop at 2pm on Saturday, in the Workshop Wigwam. Gingham covered thanks to Alice for organising the Workshop Wigwam. We had lots of fun with all the buntees! All your bunting designs were wonderful and you were all fab to meet. We were overwhelmed by the group who greeted their friend off the train with the birthday bunting they made!